Over the past four or five years, Jim Carrey has seemed bent on establishing himself as a serious actor, tackling roles in Man on the Moon and The Majestic (even playing a supporting role in Simon Birch). His last full-fledged comedic role (not counting How the Grinch Stole Christmas) was Me, Myself and Irene, which was released in June 2000. But regardless of how much his fans might complain while longing for the good ol' days of Ace Ventura and Dumb & Dumber, Carrey has never moved far from comedy. He may have been hurt when he didn't receive an Academy Award nomination for portraying Andy Kaufman in Man in the Moon, but he also seems to know what he does best. Carrey confronts this subject head-on in his new film, Bruce Almighty, where he plays a reporter named Bruce Nolan who longs to do serious news features. But the executives back at the television station know what Bruce does best -- the light bits, the segments that make people laugh. But Bruce wants to be more than the guy that everyone laughs at, the guy who always has a funny quip. He wants to be the news anchor on the station's nightly broadcast. And when he doesn't get this position (the current anchor is retiring and Bruce thinks he's the likely replacement), he reacts as if his life has gone to the dogs. Never mind that he has a great girlfriend named Grace (Jennifer Aniston) and they seem very happy together. So Bruce Almighty works like a thinly veiled attempt at self-psychoanalysis, where Jim Carrey tries to work through his own disappointment about the lack of acclaim he has earned for his serious acting roles. The screenplay might not carry Jim Carrey's name (it was written by Steve Koren, Mark O'Keefe, and Steve Oedekerk), but it seems custom made for him. Not surprisingly, the movie arrives at a position not too dissimilar from Preston Sturges' comedy classic Sullivan's Travels, in which a movie director tries to make serious movies but eventually realizes that his gift is for making light nonsensical movies -- movies that make people laugh. Likewise Bruce Almighty is about Bruce Nolan coming to accept his role in life. He'll be the best lighter-side reporter he can be. And that's enough. But what? You've heard this movie is about Jim Carrey becoming God? Well, you're quite right. Enough of this palaver about self-psychoanalysis! And on to the real subject of this movie: God (played by Morgan Freeman) tires of Bruce Nolan's constant whining and decides to let Bruce take over as God for a few days (and show him the job isn't so easy). Needless to say, Bruce does not immediately set his sights on fixing world hunger and establishing peace for all people. No, no, no. First, he sees to his own needs. (One of his first gestures is to blow a pretty girl's dress up around her neck.) Suddenly, wherever he's at, the biggest news event of the decade takes place -- such as the discovery of Jimmy Hoffa's body! And Bruce provides exclusive coverage. In the process, though, his personal life starts to fall apart -- and the rest of the world is beset with floods and riots. No, Bruce is not doing a good job as God. It seems the job is much more difficult that he ever imagined, especially the part about listening to prayers and granting requests. Director Tom Shadyac has worked with Jim Carrey twice before, in Ace Ventura and Liar Liar. In comparison to the Farrelly brothers' work in Dumb & Dumber and Me, Myself and Irene, or to the Tex Avery-inspired The Mask (directed by Chuck Russell), Shadyac's work is relatively anonymous. Instead of relying on his ability to tell jokes with the camera, Shadyac relies upon special effects -- such as a file cabinet drawer that slides out for a hundred feet (pulling Bruce as it goes) or a dog that does its business while seated on a toilet, reading a newspaper, or a scene where God and Bruce have a conversation while standing on water. Not surprisingly, Shadyac also directed Eddie Murray in the special-effects heavy The Nutty Professor. His camera work can be manic and frenetic, but it's also rarely inspired. So goes much of this movie. The special effects ARE the inspiration. As a result, the movie becomes mechanical. It lacks spontaneity, which is a paradox because Carrey is one of the most spontaneous actors/comedians on this planet. The best moments in the movie don't involve special effects at all. Arguably the funniest scene comes when Bruce uses his powers to turn to gibberish everything that rolls off the tongue of the news anchorman. This scene is all Steve Carell, who you might have seen on The Daily Show with John Stewart or Watching Ellie (opposite Julia Louis-Dreyfeus). During the preview screening that I caught, the audience was on the verge of hysterics during the aforementioned scene (and I was laughing so hard that my eyes watered). Carell almost steals this movie away from Carrey, but make no mistake about it, this is Carrey's movie (so his willingness to give Steve Carell room to shine is commendable). Carrey's on screen in almost every scene. The movie is designed to allow him free reign to indulge in outrageous behavior. First, this behavior takes the form of double takes and stunned expressions. But as Bruce learns to accept the powers he has been given, Carrey then indulges in manic grins and barely contained giggles. This is some of the stuff that Carrey does best. And with Carrey goes the rest of the movie. Bruce Almighty is possibly Carrey's most enjoyable movie since Liar, Liar. 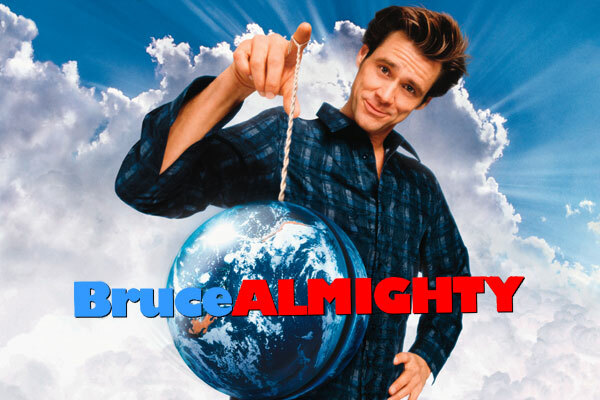 While other recent comedies (such as Anger Management) turn to shambles when they concentrate on storytelling (instead of just doling out the jokes), Bruce Almighty balances just enough plot revelation mixed with humor to keep the story moving along at a brisk-but-not-too-breezy pace. Whereas Anger Management can't come to a conclusion without indulging in over-sentimentalized theatrics, Bruce Almighty keeps a few surprises in store and even toys with the idea of an unhappy ending before finally spinning to a conclusion. Jennifer Aniston fares well in an underwritten role as Bruce's girlfriend. Typically, this type of role gets thrown to a little-known-but-beautiful actress who doesn't have the foggiest idea how to bring her character to life. Aniston, however, is a much stronger screen presence. In films such as The Good Girl, she has shown great promise that she can make the jump from television situation comedies to feature-length films. Here she does little more than present a more down-to-earth version of the character that she portrayed in Friends, but she's so good at it that her character becomes a good counterweight to Carrey's madcap antics. As a result, the movie as a whole feels buoyed by her presence. And with Morgan Freeman, the filmmakers chose an actor of great stature who can underplay the role of God. His quietness works well against Carrey's hyperactive twitches. The set designers place Freeman in sets that are mostly composed of one color -- white -- which has the effect of drawing all our attention to his face and thus emphasizing further his importance. It's a nice piece of art design combined with Freeman's quiet authority. So does Jim Carrey's success in Bruce Almighty mean he will forgo dramatic roles in the future? Will he follow the lead of his Bruce Nolan character and be satisfied with what he does best, comedy? Probably not. But it lets you know that he's struggling with the issue of recognition. Some other comedians, such as Tom Hanks and Robin Williams, have gone dramatic and even won Academy Awards in the process. But this movie might serve as an indication that fans of Jim Carrey might not have to wait so long between movies for their next fix of Carrey's comic genius. Photo credits: © 2003 Universal Pictures. All rights reserved.